This op-ed originally appeared on Women News Network. 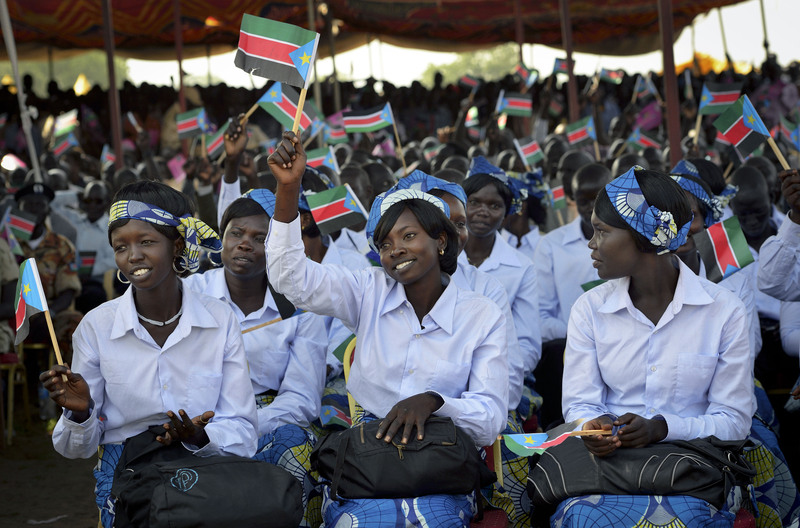 During the first year of independence for the world’s newest nation, women of South Sudan united to amplify their voices and ensure their rights are guaranteed in the constitution and enforced by the government. These efforts have led to some milestones in the development of women’s rights in South Sudan, but many challenges still remain. At the top of the list is education. According to the National Baseline Household Survey conducted in 2009 and released in June 2012, only 28 percent of women in South Sudan ages 15 to 24 are literate and only 16 percent of females older than 15 are literate. Additionally, the survey reported a gender parity index showing a 7-10 female to male ratio for primary school education in South Sudan, compared with 4-10 female to male ratio at the secondary level, indicating that more than twice as many males attend secondary school than females. This gendered gap in education is rooted in traditionally held beliefs and practices that women are better off to be married at a young age than kept in school. This has become a primary concern for many South Sudanese women, who are pushing for legislation that would prohibit marriage before age 18 to ensure their daughters a chance at education. Sarah Cleto Rial, a native of South Sudan who now serves as program director at My Sister’s Keeper, a Boston-based, humanitarian action group that works to empower the women of Sudan and South Sudan, said, “I believe it is my education that got me where I am.” From a young age, Rial’s parents instilled in her a strong belief in education and she has been working to achieve this right, among others, for the women of South Sudan. South Sudanese women have successfully advocated for an affirmative action quota to be included in the transitional constitution that would guarantee 25 percent female representation at all levels of government. Although this stands as a landmark achievement, some women fear the 25 percent quota could become limiting, and hope to increase the quota in the permanent constitution to 30 percent. Lilian Riziq, who was appointed in July as Minister of Agriculture, Forestry and Irrigation in Western Bhar El Ghazal State, Wau and who formerly served as director of South Sudan Women’s Empowerment Network, was at the forefront of the women’s movement to pass the affirmative action gender quota. So far, the 25 percent representation has not been realized at all levels of government. Implementing the quota at the more localized county and village levels remains particularly challenging, as customary law still takes precedent. “At some point we have to find a way to harmonize our customary laws with our constitution and bill of rights,” Riziq said. This is a difficult obstacle at the moment, because customary law generally discriminates against women. She said that local, traditional leaders need to be aware of women’s rights guaranteed by the new government to ensure that societal norms change. Rial suggested that a national outreach campaign take place through broadcast media and personal outreach to inform all citizens of their rights and what to do if they are violated. At the national level, significant gaps remain in the implementation of the 25 percent quota. Notably, no women sit on the nation’s 15-member Austerity Measures Committee established by President Salva Kiir. Therefore the national budget is being determined without women, who tend to prioritize programming for education, health care, infrastructure, and clean water over military spending. Rial and Riziq also pointed out the overwhelming lack of women seated at the table during the entire North/South negotiation process. A current lack of funding and resources for women’s groups threatens the safe space and advocacy networks that have been established. The women who are in government positions must maintain strong connections with women in the grassroots and advocate for inclusivity of other women who are qualified, said Rial. Nevertheless, the independence of South Sudan has opened up opportunities that previously these women could have only dreamed of.